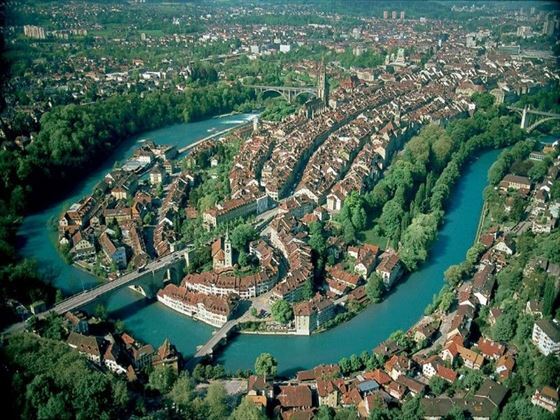 Panoramic city tour of the delightful Swiss capital Bern, seeing the Bear Pit and highlights of the Old Town. Your tour begins in the UNESCO World Heritage site of Bern, the capital of Switzerland, and this evening enjoy a welcome dinner of traditional dishes with your fellow travellers. 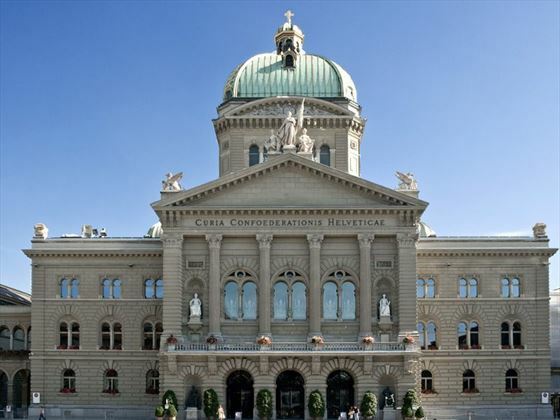 Discover delightful Bern on a sightseeing tour featuring the Swiss Parliament building (the Bundeshaus), the famous Bear Pit, the beautiful Rose Garden and the 15th century cathedral. The remainder of the day is yours to explore more of this lovely city and perhaps enjoy coffee and cake in one of the atmospheric cafes. 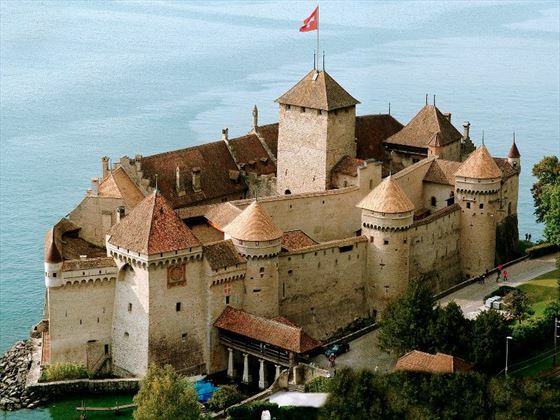 Travel along the shores of Lake Geneva to the magnificent castle of Chateau de Chillon. 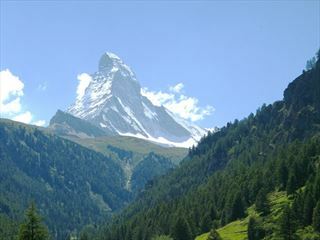 Then take a ride on the GoldenPass Panoramic Train from Montreux and enjoy the beautiful views as you climb the mountain. Disembark at the world-famous Alpine ski resort of Gstaad and take time to enjoy the ambience of this delightful place filled with traditional wooden chalets. 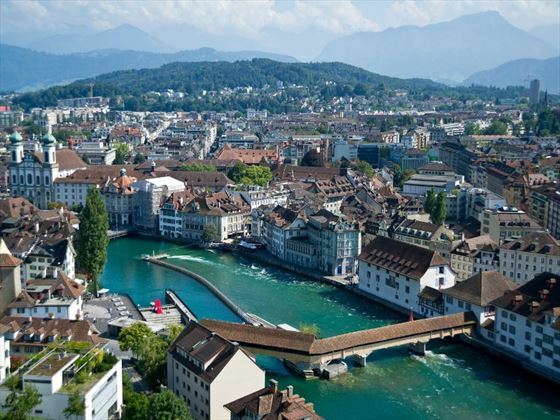 Take a trip to Lucerne - a wonderful town with a mix of ancient and modern in a truly stunning lakeside setting. 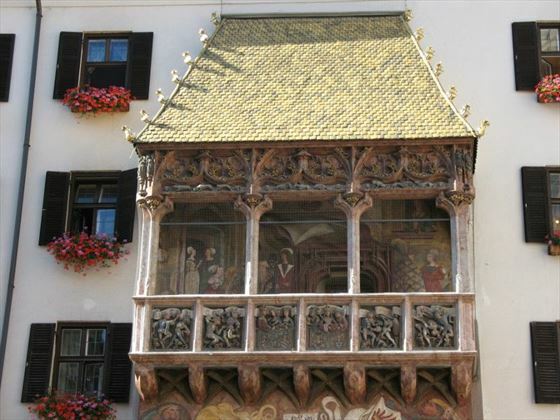 Enjoy a leisurely paced walking tour of the old town (Alstadt), exploring hidden gems. See medieval treasures such as the Chapel Bridge (Kappellbrucke – the oldest wooden covered bridge in Europe), the Watch Tower, the Town Hall and the Lion Monument carved from natural rock to commemorate the heroic Swiss Guard. Return to Bern where this evening you will enjoy dinner in one of the city’s most famous local restaurants. Leave Bern and travel to Austria through the tiny principality of Liechtenstein – the richest country in the world and the only country to lie entirely within the Alps. Continue to Innsbruck nestling in the heart of the Austrian Alps which will be your home for the next four nights. A local guide will take you on a city tour taking in the elegant boulevard of Maria Theresienstrasse, the Imperial Palace (the Hofburg) and the iconic Golden Roof. Journey across the picturesque Austrian countryside to the musical city of Salzburg – hometown of both Mozart and “The Sound of Music”. 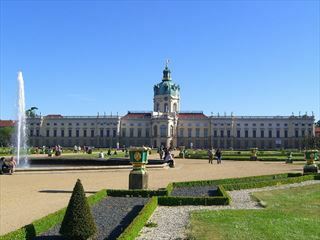 Take a walking tour of this beautiful city, seeing highlights such as the Mirabell Gardens and the birthplace of Mozart. Enjoy an afternoon at leisure to explore the Old Town where you can visit ancient churches, browse traditional shops and relax in a quaint café. 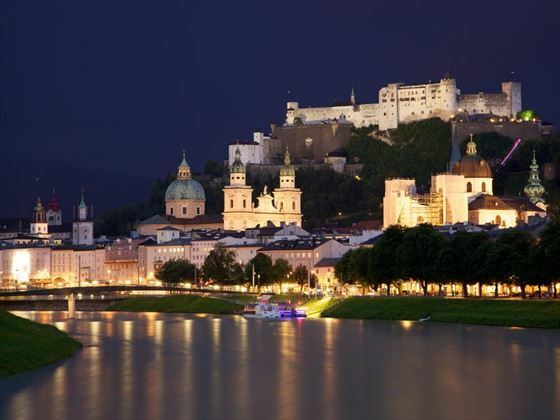 Remain in Salzburg for a dining experience at the 1200 year old St Peter’s restaurant – the oldest in Europe. 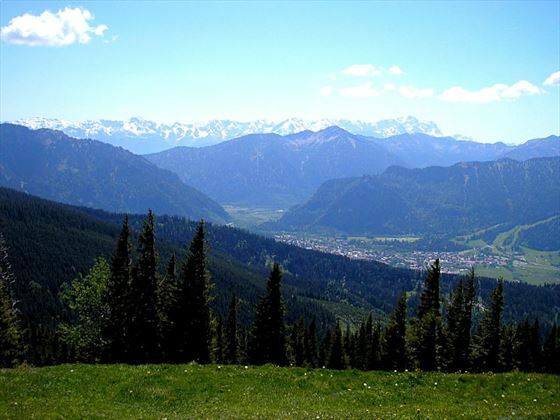 Enjoy a free day in the lovely city of Innsbruck, capital of the Tyrol. 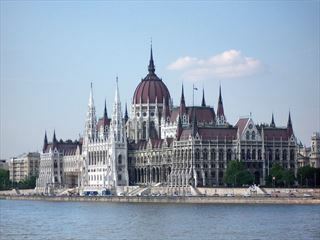 You may stroll through the old town and browse the shops or take the funicular up the mountain. 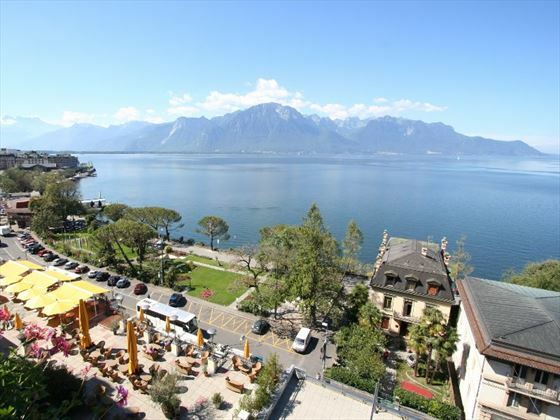 There are many cafes and bars to relax over a drink and enjoy the stunning views of the city and mountains. 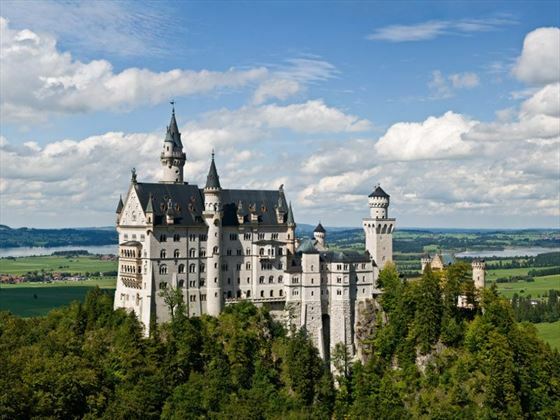 Today you will make a memorable visit to the fairy-tale castle of Neuschwanstein – the inspiration for Disney’s Sleeping Beauty Castle. Then visit the wonderful baroque Wies Church with splendid statues and frescoes – a World Heritage site. Continue to the picturesque village of Oberammergau. Here you will learn the history of the village and its famous Passion Play – performed only every ten years to fulfil a pledge make by the villagers to God for sparing them from the bubonic plague in 1633. Later you will experience the rich musical tradition of Austria during a Tyrolean folklore show, and afterwards you will treated to a farewell dinner in one of Innsbruck’s most popular traditional restaurants.